Tools whether you’ve been into DIY for years or you are only just starting out. There’s nothing better than finding a solution that cuts down the time or energy needed to pull off a job. There are hundreds of different tools out there. Most of which you probably haven’t even heard of let alone know what to do with. If you are about to do a big DIY job it is worth doing a bit of research. In some circumstances they can drastically increase the speed of the job. They can greatly reduce the effort you need to put in too. Finally, some tools will deliver a quality of finish that simply isn’t possible without them. There are lots of cheap hand tools but you can find they don’t always give the best results. Don’t forget that tool rental provides you with the opportunity to rent well maintained and professional quality tools. This can be for the same or less than the price of a brand new cheap hand tool. So if you are doing a one-off job find your local tool rental depot rather than buy. Painting is often one of the most impactful yet time-consuming stages of any DIY project. Still think a good roller is the best way to cover large areas? Not anymore it isn’t. With a compact sprayer, you can make light work of painting huge areas. With maximum control and minimum levels of spillage. They’re expensive pieces of kit so it’s probably best to hire one if you’re working on a one-off project. Compact sprayers will work with most water or solvent based paints. They allow you to stay relaxed and demand far less physical work than having to throw around a paintbrush. The condensed air ensures the spray is applied as neatly as possible. This is without the risk of splash back or any nasty accidents. A must for anyone that loves a fresh coat of paint but hates the horror of stone-age painting tools. You will need to buy some plastic decorating sheets and decorators tape. This will help to protect floors and adjacent walls or ceilings.Hhowever these materials are cheap and easy to fix in place. You should also buy a decent quality face mask to prevent you from inhaling any of the paint vapour. Decking has become very popular and looks great in gardens. But it can also become green, grimy, slippery and plain dirty after a while. Timber decks become exposed to sunlight, rain, snow and frost. This will lead to a deterioration of the colour if nothing else. However you can get it back to the way it once was with some deck maintenance! There are 3 easy steps to get your decking looking good again. What you need to do is a three stage process; clean, restore and finally protect. Discolouration is the obvious problem as un-stained timber outside eventually turns grey. Protective action can help this problem. Which is caused by fine dirt particles entering the microscopic ‘pores’ of the timber. The timber itself loses colour as ultra violet rays from the sun react with timber. In this case, simply cleaning your deck will not restore the original colour. Though it will make it more attractive! Discolouration of the deck timber has many causes. This depends on the area in which you live. Together with a number of biological causes. Dirt by way of dust particles, overhanging tree debris, bird droppings, BBQ debris! Biological degradation of decks include, fungal activity, moulds and decay. In shaded areas algae or moss. Stains from unsuitable fittings can cause problems. Such as un-galvanized nails, screws and bolts. Problems that can be prevented are those when placing planted containers and furniture on the deck. Planted containers are great deck assets. But should have a moisture-proof stand underneath. Do your planting and re-planting off the deck. Or with a good protective groundsheet under the work area. There are several preparations available from DIY stores which to clean your deck. Go for the brand names, or good store own brands. Do not attempt to treat your deck or stain it without firstly cleaning it. An alternative, is to use a weakened solution of TSP (trisodium phosphate). Available from any good paint shop. (It is used by pro painters to clean paintwork). Add some household washing-up liquid to ensure a deep penetration. Try a small area first, and use as directed on the container. Do not use any chlorine based bleach. As this will clean your deck of algae and mildew in particular. But it will also break down the lignin in the deck timber. And this holds the wood together! A weak solution of Citric Acid will brighten up old greyed timbers. Most important – it is a non hazardous way of cleaning your deck. Some proprietary brands of wood bleach available, will do the job. Hydrogen Peroxide will do wonders for lightening old timbers. In particular it is good for the older darker deck timbers. It evaporates away, leaving no residues. Most fungal growth can be treated with a general garden fungicide! If you use a combined Fungicide/Insecticide to clean your deck. 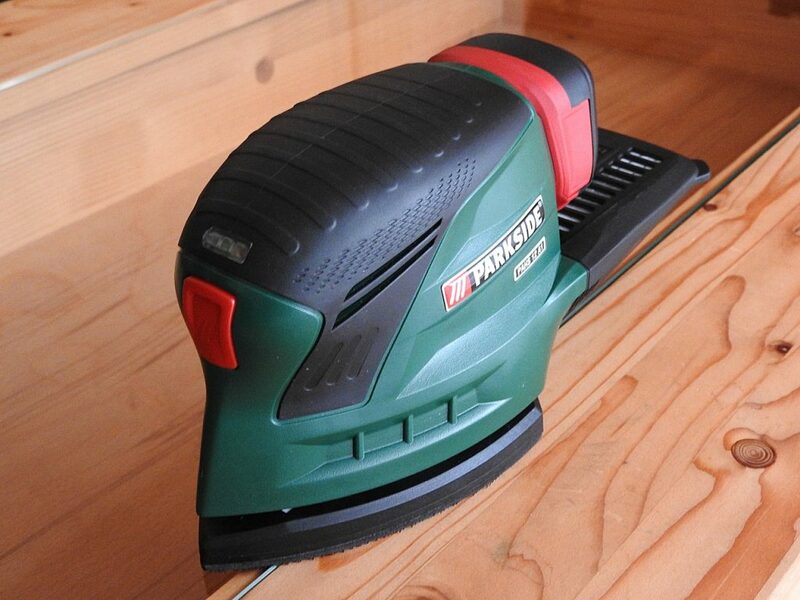 This also kills many hidden insect pests lurking under the timber. This treatment does not lighten the wood or actually clean it of dirt. It simply for fungi/mildew and insects. It is not for cleaning the deck simply to rid it of any infestation. Whether fungal infection will occur depends on materials used in the construction. A jet washer can be used for cleaning decks but must not be a heavy duty one. Something smaller than 1500 psi with a wide fan jet will clean most decks. Anything more powerful will leave the timber with a wooly finish, as it will destroy the wood fibres. The result will be a deck that is very difficult – if not impossible – to clean or to treat. Once the deck is clean – then and only then – you can think about a long term treatment regime. To enhance the colour and longevity of your deck. Even after a suitable treatment application, regular cleaning of your deck is important. This helps maintain the colour of the deck timbers. Wood like all living things is made up of a honeycomb of minute microscopic cells. Softwood or hardwood, the cells are there. They are empty, waiting to be filled up with whatever is available. Deck boards are different in one respect to other timber structures outside. Deck boards lay horizontal not vertical like walled structures. So dirt and dust is not readily washed off. It simply lays on the deck until it finds a home. If it is larger than the cellular structure of the wood it will eventually wash off. If it is dust and smaller than the cell structure, then it will fill the available cell. This cell structure can be capped by using decking oil. Although treated in the factory, this does not mean that it requires no further treatment to alleviate stains and grey-coloured decks. 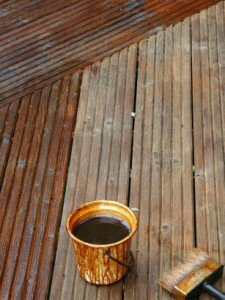 Ordinary deck stain, simply colours the surface area of the timber. It does not fill up the cells, so dirt is still able to fill the spaces. A deck sealer is required to do the job. Decking oil is a special treatment/preserver that whilst applied as a liquid has a high solids content. So when it dries it solidifies filling the pores and cells. Deck oil has high penetrating properties. So it can enter and then solidify in the individual cells. Some deck stains simply coat the cells, leaving room for the dirt to accumulate. Penetrating oils are better for deck maintenance than polyurethane or varnish type finishes. Oils do not crack as the timber expands and contracts under weathering. Deck oil treatments improve the structure of the timber. Because once dry, the solids are stronger than individual wood fibres that they bind together. 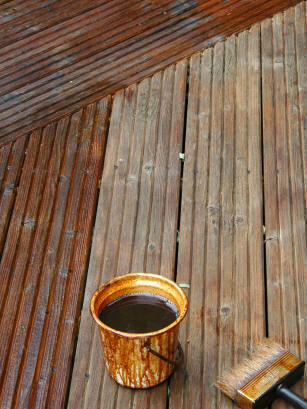 Decking oils actually replace the natural oils and resins that get lost over time with decking. Decking oil should be applied after the deck has been cleaned. We do not advocate the use of pressure sprayers. If used indiscriminately a pressure jet can ruin the surface structure of the timber – leaving it with a ‘wooly’ feel – difficult to clean. The oil should be applied in two coats using a soft-haired paint brush. The soft-haired option will allow for even spreading of the deck oil. This also act as a sponge to mop up any surplus deck oil, which can then be used further along the board. The oil should be applied thinly. Then well brushed out to ensure no puddles of surplus oil are left on the deck. This is particularly the case with grooved deck boards. As surplus oil can linger in the grooves. This gives a poor appearance, and also takes time to dry. With a thin application, the first coat will normally be touch dry in an hour. This relies on ideal weather conditions. A second coat is necessary to protect the timber. This also enhances the colour if using a tinted oil. Choosing coloured oils adds impact to your deck. Choose a lighter colour if you are uncertain. It is easy to darken a lighter colour by oiling with a darker colour. It is impossible to lighten the colour after using a darker coloured oil.